With Christmas coming up very quickly (seriously, where did November go?!) I thought I'd share a few of my favourite Disney-related gifts that I've spotted around recently. All of these are less than £10 each so they're perfect if you're on a bit of a budget like me! 1. Although it's a bit pricey (I'm used to paying about £3 for a notebook!) this journal is worth every penny. There's so much detail on the inside and it's separated into sections with artwork of all five emotions on. The perfect gift for any students in your life! 2. I've got a quite a few of these boypants from Topshop and they are so cute and comfy. They come in a range of designs and they're on offer for 3 for £10 so they'd be great stocking fillers. 3. The design on these lip balms is so adorable! They come in three gorgeous Cinderlla-y designs including the one above which has a clock face design and "home before midnight" on. 4. This mug would be perfect for any Frozen fan. The artwork is so beautiful and for less than £8 you can't really go wrong! 5. When I'm feeling particularly anxious about anything I take my mini Baymax Tsum Tsum with me as he's small enough to fit into my bag or coat pocket (and to think I'll be 25 next year...). Clinton Cards have just released the Big Hero 6 Tsum Tsum collection so if you've got someone with a lot of stress or worry in their life, a mini Baymax might be the perfect companion! 6. If you hunt around you can usually get Pop! Vinyls for around £10 and there's so many Disney characters to choose from so you're sure to be able to find something to suit the person you're buying for! They'd be great to give to someone to put on their desk at work, or to fill in spaces on DVD/bookshelves. 7. This Minnie Mouse back pack is such a bargain for only £10! Plus I like that the design isn't particularly in-your-face Disney, this could make a great gift for someone who has got a trip to the parks planned for 2016! 8. It's a colouring book. For adults. That lets you colour in Disney Princess pictures. Need I say more?! 9. I actually have this Pascal teddy myself and he really is so cute! He's also the perfect size for cosplaying - I used him for my Halloween Rapunzel costume and he fit perfectly on my shoulder! Hope these ideas help with your Christmas shopping! This is such a sweet collection of gift ideas! I have the Disney princesses colouring book and the Baymax tsum tsum (I'm Baymax obsessed!) and I love them both! 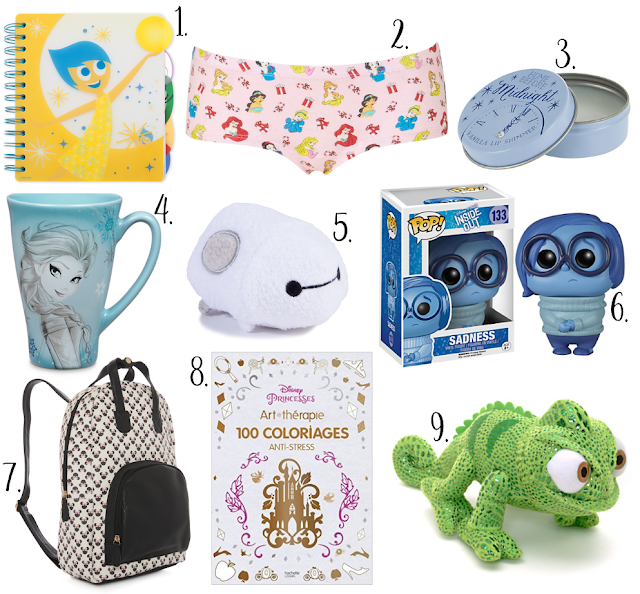 Seriously, though, if a gift guide includes Pascal and Sadness, you know it's going to be good! Literally drinking from the Frozen mug whilst reading your blog. I love your Disney Wishlists!